The style of the 1950s has become synonymous with 'vintage', but the mainstream seems to have focused mainly on full circle skirts, neglecting some of the other style staples of the decade. I do love 1950s' style, but I have to admit that my favourite silhouettes from the era don't actually include circle skirts - shock horror! 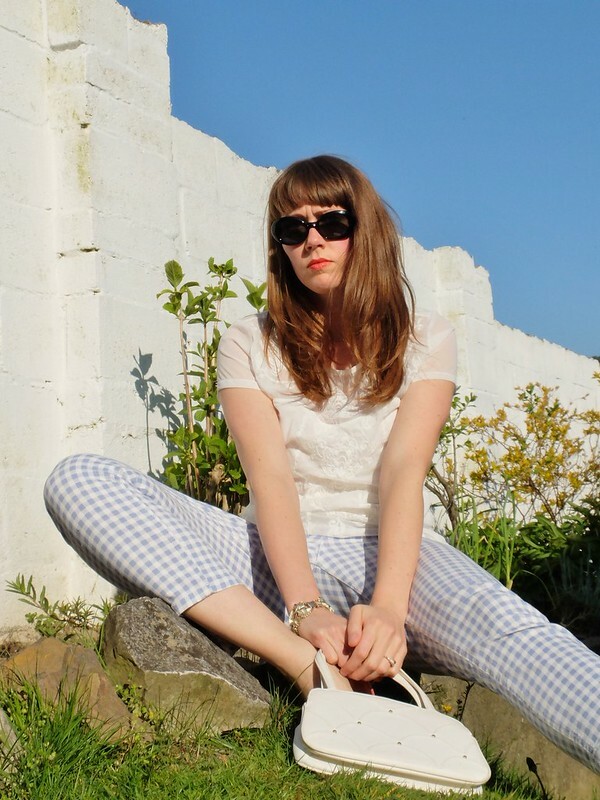 Here are my top three fifties' favourites. Moving on from the 1940s, the 1950s saw suit jackets being even more nipped in at the waist, and skirts moving from a-line to pencil. In my mind, the '50s suit is always perfectly demonstrated by the many heroines of Hitchock films of the era, in particular Kim Novak in Vertigo in that grey suit. I tried to recreate that Hitchock heroine look, with a couple of suits that I own. The first grey one isn't that old, but the green one is original vintage. See the full Hitchock Heroine post here. Epitomised by Marilyn Monroe's on-screen wardrobe and guaranteed to put a wiggle in your walk, the pencil skirt or dress is perhaps second in popularity to the '50s full skirt. Dior's 'New Look' started off with hemlines 12 to 14 inches from the ground, but I have to admit that it's hard for me to find skirts and dresses that long on my tall frame. That would mean a skirt length of 31", when most reproduction clothing is around 27" (and some even shorter). In the 1940s trousers were wide and long. In the '50s, they're more figure-hugging and cropped, quite the departure. We all know that Audrey Hepburn wore black capris, but Grace Kelly and Marilyn Monroe both wore jeans rolled up to cropped length. I love this look for the slightly warmer months, I think there's something timeless and effortlessly chic about it. So there you go, my top three 1950's looks don't even include a full circle skirt! What I love about 1950s looks is the versatility - capris one day, fitted pencil suit the next. A great balance between dressed-up formality and casual practicality. The 1950's look has to be one of the easiest to recreate from the high street too. What do you love about 1950's style? Are you a die-hard fan of circle skirts?? 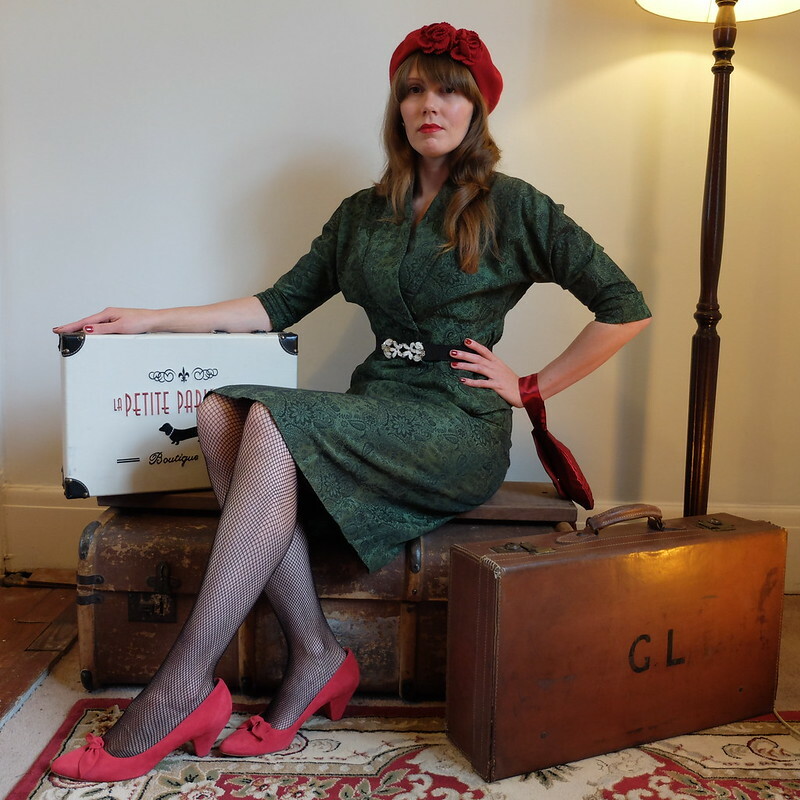 This post is my entry to become the face of the 1950s for the charity Oxfam, who are running a contest for vintage fans. Great outfit all are so stylish of the 1950's, though personally myself I do like a circle/swing dress or skirt as well! That vintage suit is a total dream, and it fits you so well!! You are really good at knowing your siluette and what suits you, I am just too lazy, and wear circle styles most days because I know there comphy for work. I love the Capri pants look but I am very much pair shaped, which can make that and wiggle skirts a struggle. Wide hips, and wider/ shorter legs! It makes it interesting to see how clothes I can't get away with fit on your frame that's so different to mine. Very beautiful all the clothes you have chosen! The gray suit is fantastic, as well as the fabric of the green, and then you have some really nice bags! Ah, you look so good in cropped trousers! I always look like a nanna on a cruise holiday, though I have decided to live with that this summer and wear crops anyway - I shall just have to make sure I have extra-funky accessories to compensate. Your suits are wonderful too - there's a rough dating guide to St Michael labels online somewhere. Oo that's handy to know about the St Michael labels, cheers for the tip! You are killer in all these great looks. I'm a sucker for a fit and flare dress. I just find them the *most* 1950's. They always remind me of either my Mom or Betty Draper. Ahhh I LOVE that suit - I'm going to see Vertigo on the big screen in a few weeks and I'm wondering whether I should wear a rendition of an outfit worn in the film! loving all your outfits! that red polka dotted dress is so gorgeous! The green suit is my favourite on you, it fits beautifully and the colour is stupendous. I'm not a 1950s fan normally but do like your grown-up interpretations of the era. What a great recap - and I have to say that even though I like them all, that first picture is FAB, it looks like a shot for a film. I am a massive fan of the Hitchcock heroines and their fab suits. The grey one in vertigo is incredible! I love all 50s looks but admit a full skirt is super impractical so rarely comes out. The wiggle styles are just better for day to day. And I never could resist a Capri pant!!! I think the reason why the circle skirts get all the glory is because they're so easy. Easy to make, easy to fit (since they really only need to fit in one spot), easy to find. The more fitted looks are so fabulous, though, and absolutely worth searching for. A good suit can make you feel perfectly pulled together, the pencil skirt is the most amazing thing to show off your curves, and the cropped trousers are so cute and practical. I love the reminder of how fabulous the less common styles can be. I love all of these looks, there's so much more to the 50s than just full floral dresses! I'm desperate to find a pair of capris this year that fit my stubby legs and curvy hips!